It was August 2011, I was 25 years old, eagerly awaiting my first international trip. As I assembled along with a bunch of 50 excited youth to board our Austrian airways flight to Rome, the fun had already begun. My brother Binoy and myself along with other youth from across Mumbai and India were going to be part of the World Youth Day Celebrations in Madrid. This event is celebrated every 3 years, where catholic youth from across the world gather, spend time in fellowship, prayer, attend a Mass celebrated by the Pope. The Church in Mumbai did a good job of alongside Spain, planning a tour of Italy and France as well. The day had arrived. As we boarded our flights, I sat back to relax with a glass of white wine, my mind already imagining the pleasures that Italy had in store for us. We landed at Rome, quickly found our way to Peter Pan hostel where we unloaded, freshened up and hit the streets of Rome. Our first meal was rather too bland for our spicy palette and we drowned the freshly made chicken in multiple bottles of ketchup. We then headed to the Colosseum, one the wonders of the ancient world. The Colosseum still an iconic symbol of Imperial Rome, was commissioned in AD 72 and gained popularity by staging deadly combats of gladiators and wild animal fights for public viewing. Entry was 11 Euros, which would have gone up by now. Having spent a few hours here, touring the nooks and corners of this majestic symbol, we moved to Trevi fountain. A traditional legend holds that if visitors throw a coin into the fountain, they are ensured a return to Rome. Of course we pulled out the few Indian coins we had left and tossed them into the fountain, closing our eyes and wishing to come back to this enchanting country once more. By now I was quite hungry and treated myself to a large scoop of some delicious gelato before heading to Spanish Steps another example of the Roman baroque style. It is a great place to just sit down and enjoy the atmosphere and views of the Eternal City. Soon it was night fall. Tired, having not slept since the previous night as well, we headed back for dinner to a meal of Spaghetti, cooked with a little more spice, making it delicious before calling it a night. The next morning we packed sandwiches along with Italian plums the tastiest I have ever had in our picnic baskets, as we headed over to Vatican City. The line was very long, but thanks to the group taking us, our tickets were pre booked making our wait time minimal. I would recommend anyone visiting the Vatican to take a guided tour of the place. It is well organized and covers a lot. We spent time in the Vatican Museum, St. Peter’s Basilica and the Sistine Chapel.The ceiling of the Sistine Chapel is one of Michelangelo’s most famous work. One can also visit the Dome of the Basilica (an elevator will take you half way up) and the Catacombs beneath the St. Peter’s Basilica, burial spot of the first Pope, St. Peter. Saying a prayer for our family back home and thanking the Lord for this trip, we came out of Vatican City feeling spiritually renewed. We then opened our lunch baskets, while sitting at the side of the road, sampling a few souvenirs before heading for Basilica of St John, Lateran. This is one of the oldest Church’s in Western Europe. The Holy Steps or Scala Sancta are a set of 28 white marble steps located within the Lateran Basilica. According to the Catholic tradition, they are the steps leading up to the praetorium of Pontius Pilate in Jerusalem on which Jesus Christ stepped on his way to trial during the events known as the Passion. The stairs were, brought to Rome by St. Helena in the fourth century. For centuries, the Scala Sancta which has the blood stains from Jesus has attracted Christian pilgrims who wish to honor the Passion of Jesus. 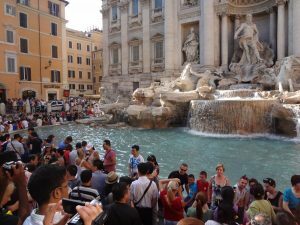 Finishing the religious tour of the Roman city, we headed back to Trevi fountain to savor in the culture and food of the food capital of the world. Finding a pretty open air restaurant we sat down to order a traditional Italian Pizza with a glass of red wine to celebrate out last night in one of the oldest and once upon a time the capital of the ancient world. The next morning, bright and up early, we packed our bags and headed to our bus, scheduled to take us to Spain. The journey was long, taking us 24 hours across coastal towns, passing Monaco and finally reaching Leida in the Catalan district of Spain. Special mention of our bus driver Andrea Salche, for his charm that made the drive even more delightful. That being said, all Italian men have irresistible charm, making them romance gurus. Back to Spain now, this is where the group now split to re-group a few days later. The week before the actual World Youth Day is dedicated to Days in the Dioceses. 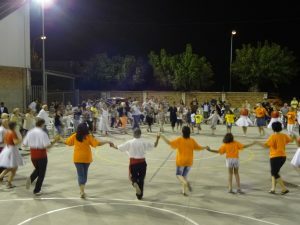 While some us enjoyed home stays with families in a little village Castellserra, other were put up at Balaguer. This was definitely one of the biggest highlights of the trip. Living with a Spanish family for five days. Erica another member from our group, and myself were hosted by Cristina, a warm and welcoming Spanish woman in her 70s. Tired for the long journey, we soaked ourselves in the bathtub, before gorging on the tastiest ham sandwiches I have ever had . Along with the Indian group, we made friends with a youth from Solvakia also being hosted in the same village. While days were spent, helping with painting and other odd jobs in the village, evening and nights were spent tasting traditional Spanish cuisine consisting of varieties of ham, olives, and paella loaded with seafood, learning cultural dances of the Spanish and Slovakians (will never forget the song Macekjo the Slovaks taught us) and bonding with our new friends. We did a one day trip to Barcelona, and saw the famous Sagrada Familia, the Barcelona harbor and F.C. Barcelona football stadium. Soon five days were over, and it was time to move to Madrid for the main event. None of us wanted to leave our families. 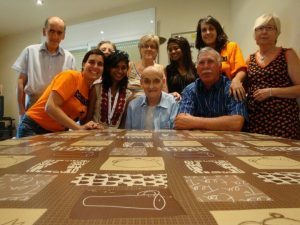 Their love and warmth had definitely touched us, in spite of the language barrier. We were later told that to make us feel welcome and comfortable the youngsters in the village had been taking English classes for the past 6 months. Even Cristina had an English dictionary to help us understand each other better. De Nada to all of u from Castellserra for making our time there unforgettable. I didn’t use Gracias, since Castellserra falls in Catalan where De Nada is common form of Thank you. Madrid took on a world city the week we were there. 20 lakh youth from across the world gathered, walking in groups, waving their flags and shouting out slogans. The Indian group was housed in stadium in LA, along with youth from Nigeria and Germany. We slept in our sleeping bags, and were given food coupons that could be used in any participating restaurant in Madrid. Each of the days had a number of activities planned from sessions on faith, inter—religion, cultural dialogues followed by the Eucharistic Celebration. 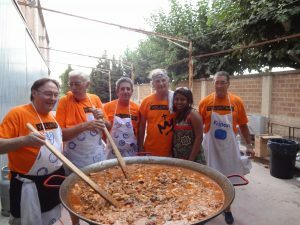 We chose to attend a few, while spending our time making new friends, touring Madrid via the metro while eating as much local as possible. We spent a day inside Santiago Bernabéu Stadium, visited the Royal Palace of Madrid, shopped at boutique outlets in Sol, and spent the afternoon sleeping in the shade at Retiro Park. The day the Pope arrived in Madrid, the streets were packed with youth from across the world waving and cheering the Pope, as he rode in his Popemobile, blessing the crowd as he passed. 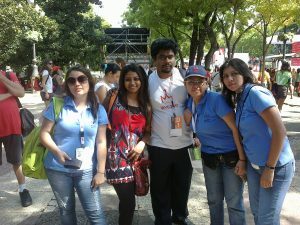 Sunday morning, was the most awaited event of the Youth Day, the Pope’s Mass. 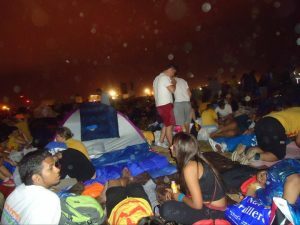 Per tradition, we gather at the Cuatro Vientos Airport for night vigil on Saturday evening. That night the skies broke loose and a one of the worst of its kind, a thunder storm took place. It was lightening and thundering while we were out in the open in our sleeping bags. But not one to have our faith daunted we continued, while laughing, and enjoying the atmosphere of tranquility yet exhilaration amidst 20 lakh youth. The next morning, the skies were bright and sunny in time for the Eucharistic Celebration by Pope Benedict XVI. He blessed all the youth, while once more urging us to say firm in our faith and announced the next WYD would be held at Brazil, South America. 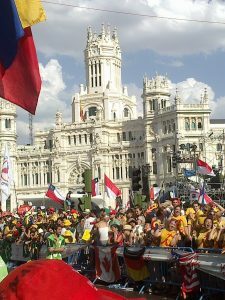 That brought an end to our World Youth Day at Madrid. With few hours left, we were back to Sol once more picking up magnets, key chains, hand fans, as gifts to give back home. As luck would have, few hours before we could leave for France we chanced upon a traditional Spanish bull fight at Ventas. It was ugly, brutal but definitely something I was glad to have not missed. We bid farewell to the volunteers at our stadium and boarded the bus for our journey to France. The next morning we made a quick stop at Navarre, the birth place of St. Francis Xavier, before reaching arriving at Lourdes a famous pilgrim spot for Catholics. Lourdes is a small town at the foothill of the Pyrénée, France. It’s known worldwide for the Sanctuaries Notre-Dame de Lourdes. 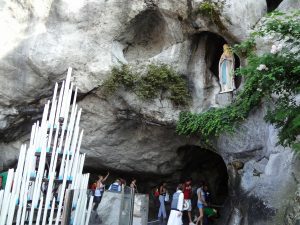 Every year, millions visit the Grotto of Massabielle where, in 1858, the Virgin Mary appeared to Bernadette Soubirous. We prayed at the shrine, attended a Mass here, and drank from the springs of holy water. That night we have a sumptuous French dinner accompanied by a glass of French wine, before we set off at midnight towards our final destination of Paris. Early next morning as the bus entered Paris, all of us scrambled to the window seats to get our first glimpse of the Eiffel Towers. Keeping our backpacks, we headed to a nearby patisserie for a typical French breakfast. 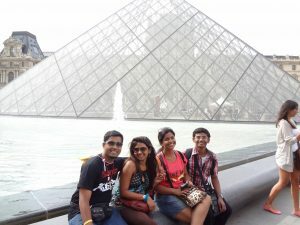 Now feeling full and ready to explore the world’s fashion capital we headed out to take on Paris. Our first stop was the Eiffel Towers by daylight. We posed for pics while admiring the beauty and vowed to come back that night to feast our eyes once more. Our next stop was the beautiful Cathedral of Notre Dame, a medieval catholic Cathedral and the Arc de Triumph, one of the most famous monuments in Paris. It stands at the western end of the Champs-Élysées the most famous avenue in the world. The Arc de Triumph honors those who fought and died for France in the French Revolution. 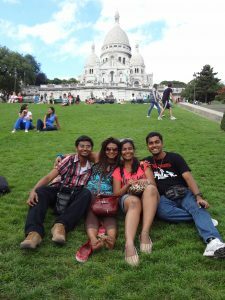 We then headed towards The Basilica of the Sacred Heart, commonly known as Sacré-Cœur Basilica. I thoroughly enjoyed the street lanes leading towards the Basilica. Open air restaurants, shops selling accessories and fashion items, lots of chatter and gaiety in the air. To reach the Basilica, one needs to climb a quite a few steps, though the climb is not at all steep and you can rest on the grass as you walk up. By now it was night and time for us to head back to the Eiffel Towers. The wait line was long, I remember us waiting for up to 2 hours when finally out turn came. We went up the elevator to the 2nd level and then the final level. Being there, a top the Eiffel, pieced my three week Euro holiday finally together. This was that moment I will take back forever. Mid-night sky, wind in my hair, twinkling of the lights, tourist from across the world, and the click – click of the camera. We spent around 45 mins up there before we began our descent. Hungry now, we grabbed some hot dogs from a street stall right outside the Eiffel and proceed for our last night in Paris. The next morning, not to miss even a bit on the last day of the holidays, we woke up early to the chilly winds of Paris. Biting into some French pastry we headed towards the Louvre, where we spent half our day admiring the Mona Lisa and other works of Art. We spent the rest of the day walking through the streets of Paris, along the banks of the Seine, soaking in the culture of one of the world’s most loved cities. That night after our last delicious French meal, we headed towards Charles de Gaulle airport for our flight back home to India. The trip is long over, but the memories are still fresh, even today. 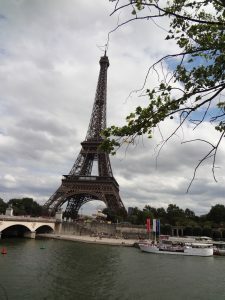 For my first international trip, I could not have asked for anything better, from touring across 3 countries, making friends from around the world, staying with a Spanish family, camping in the open the night of the thunder storm, finding our way through maps in non-English speaking countries, and ending with a kiss atop the Eiffel.